This mosaic has been removed due to the Princesshay redevelopment. This is one of three mosaics which hardly had a glance as they are at the entrance to the underground Broadgate House car park. This one is the earliest and was created in 1994 by Elaine Goodwin. 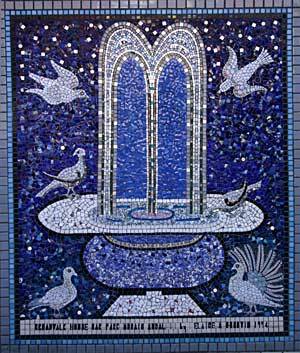 It borrows its theme from medieval Byzantine designs, depicting a fountain surrounded by doves, birds and a peacock. Similar designs can be found at the Tivoli in Rome and, in Galla Placidia, in Ravenna. Elaine worked on Sundays because of the volume of cars entering the car park in the week. It alludes to its position in a car park by incorporating tiny round car reflectors in the fountain that reflect the light. The Princesshay development has meant that this and two neighbouring mosaics have been removed to allow the entrance to the car park to be closed. A workman informed me that one mosaic had to be broken up but two survived to be incorporated in the new development.